I felt all those feelings, too – starting back with the city bus shenanigans or thereabouts, right through the over-drinking and bottom-pinching to his apology speech. An addictive personality is not really someone’s fault, but it is his or her responsibility. If it isn’t dealt with firmly, it takes over. It makes people do things they don’t really want or intend to do. As you say, he needs help. He doesn’t need the mayor’s job. That is well-put – that the addictive bent not his fault but it is his responsibility. I agree. When your colleagues urge you to get help, you need to listen. I agree completely that he doesn’t seem like a guy who likes Toronto much at all. But then again, the people who voted him in might not either; most of them live in the suburbs, where there are no streetcars and fewer bikes, and perhaps more segregated neighbourhoods (though definitely there is racial representation). Also: wasted time AND TAXPAYER MONEY. As if that was something he could ever ever make a case for with anyone on any side. Sheesh. Yeah, I guess Toronto and GTA aren’t precisely the same thing. And yes, the MONEY. GAH. I completely agree, Beverley. We try to teach kids that you don’t have unlimited chances in the “real world”, but Ford does seem to think he’s entitled to exactly that. 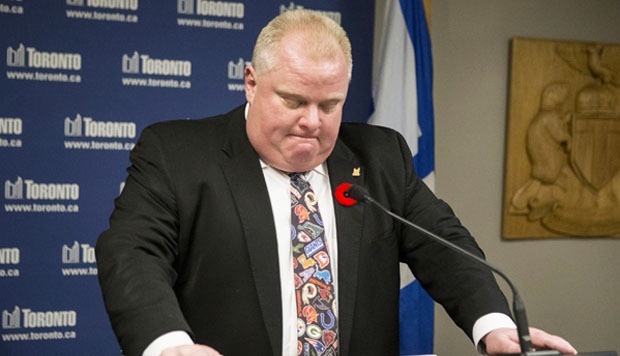 I would be horrified if my children – or any of my students – decided to look to Rob Ford as an example. Why bring Harper into this though? Your article was okaaayyyy until that point. Fair enough – obviously Canada is not of one mind regarding Harper’s Conservatives. But they’ve done an excellent job of angering a lot of Canadians in the last couple of weeks. Given Ford’s close ties with Harper, I’d say that mentioning the federal monkeybusines was entirely a propos. BTW also otherwise a great piece! A very well-written and straight to the point blog about a situation that is not only embarassing Toronto but making a laughing stock of all the rest of us in Canada. Why should any of us have to put up with this. The man needs to step down and get help or there will only be more worse disasters. Thank you, Ruth. I agree – who knows how much worse things could get if allowed to continue? Oh boy. Now there’s something I DO NOT want to think about. oh! so the Gravy Train derailed? I’m a Torontonian who has lived in London England for years, but have until now kept my Canadian citizenship, and identified myself as a Canadian and indeed a Torontonian. Canada is seriously under-reported in the British press; Australia and even New Zealand receive more attention. It’s taken the Tar Sands to get Canada in the news here, and Rob Ford to get attention for Toronto. And he’s given a _lot_ more coverage than the Tar Sands. I’m ashamed! Good to have your perspective. Gah, I can’t believe we’re now known for tar sands and Rob Ford. Now THAT is embarrassing. I spun it around and told my kids that if you do drugs and act like a fool the entire world will make fun of you and even worse you will look like Rob Ford . Ha! Reverse role model, good one. Because it’s not like the kids haven’t heard the news too. One of my Grade 6 students made a joke about Rob Ford the other day that was totally inappropriate… but I had to laugh because it was right on the money. There’s little about the guy that ISN’T inappropriate.